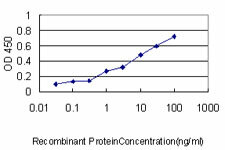 Detection limit for recombinant GST tagged TUFM is approximately 0.3ng/ml as a capture antibody. TUFM MaxPab polyclonal antibody. Western Blot analysis of TUFM expression in rat brain. Western Blot analysis of TUFM expression in transfected 293T cell line (H00007284-T01) by TUFM MaxPab polyclonal antibody.Lane 1: TUFM transfected lysate(50.05 KDa).Lane 2: Non-transfected lysate. 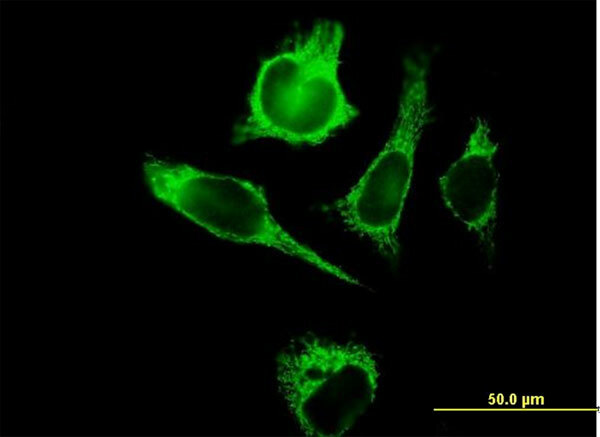 TUFM MaxPab polyclonal antibody. Western Blot analysis of TUFM expression in HeLa. 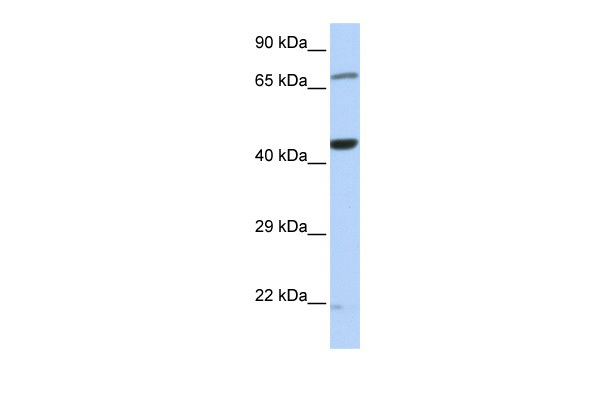 Western Blot analysis of TUFM expression in transfected 293T cell line (H00007284-T01) by TUFM MaxPab polyclonal antibody.Lane 1: TUFM transfected lysate(49.90 KDa).Lane 2: Non-transfected lysate. Western blot analysis of TUFM Antibody (N-term) (AP17813PU-N) in Ramos cell line lysates (35ug/lane). TUFM (arrow) was detected using the purified Pab. 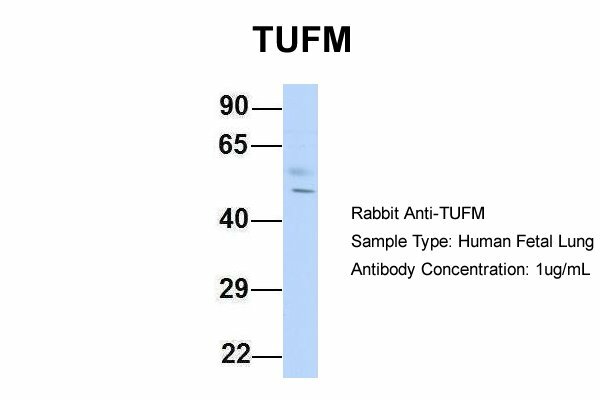 Immunoprecipitation of TUFM transfected lysate using anti-TUFM MaxPab rabbit polyclonal antibody and Protein A Magnetic Bead (U0007), and immunoblotted with TUFM purified MaxPab mouse polyclonal antibody (B01P) (H00007284-B01P). 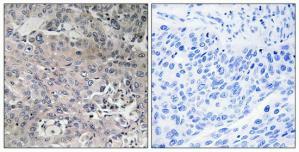 Immunohistochemistry analysis of paraffin-embedded human breast carcinoma tissue, using TUFM Antibody. The picture on the right is treated with the synthesized peptide. 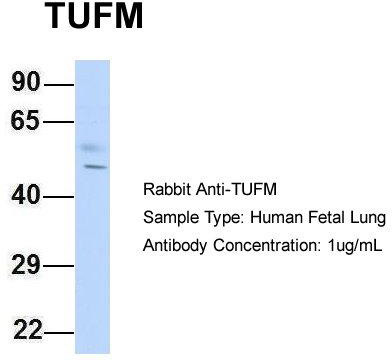 Western blot analysis of TUFM (arrow) using rabbit polyclonal TUFM Antibody (C-term) (AP54422PU-N). 293 cell lysates (2 µg/lane) either nontransfected (Lane 1) or transiently transfected (Lane 2) with the TUFM gene. Immunohistochemistry analysis of paraffin-embedded human lung carcinoma tissue using TUFM antibody.The picture on the right is treated with the synthesized peptide.